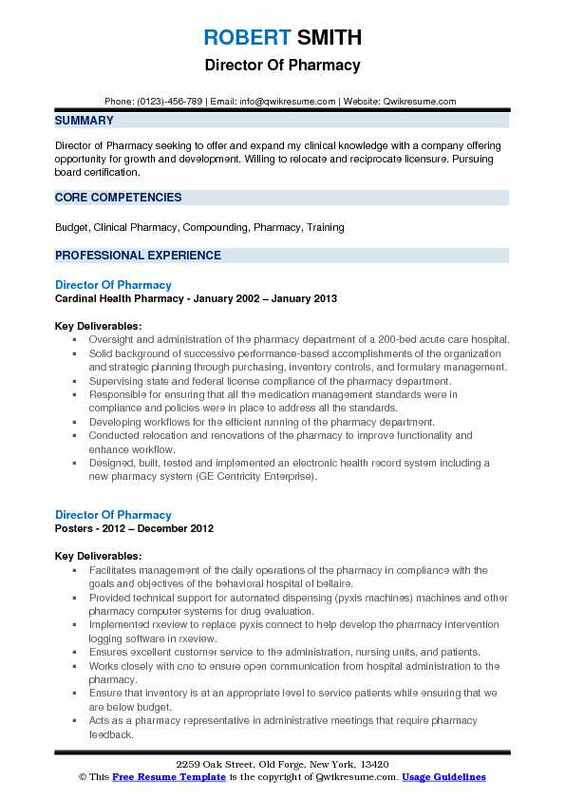 The Director of Pharmacy is accountable for managing the operations of the pharmacy department. 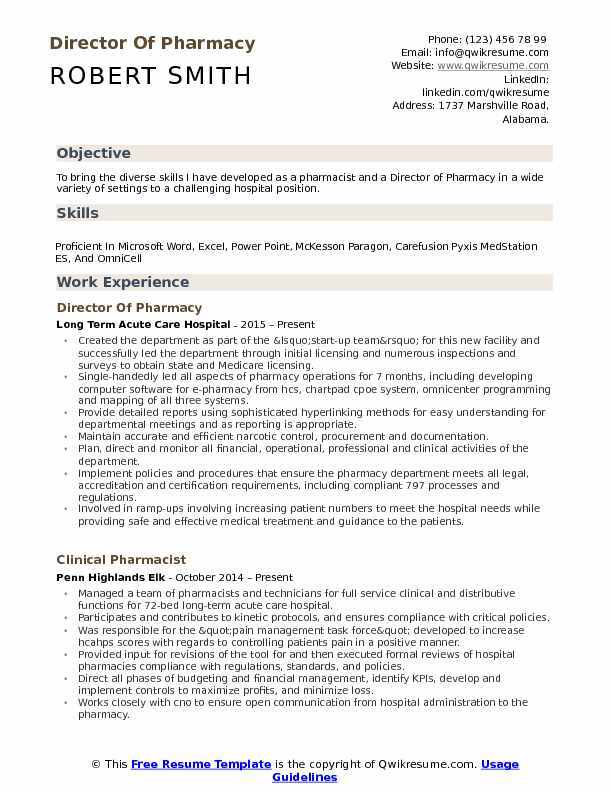 The essential duties listed in the Director of Pharmacy Resume include – planning and organizing pharmacy policies or procedures, maintaining contact with other departments, establishing methods for drug distribution and control, establishing drug quality specifications, interviewing and hiring staff, reviewing the performance, establishing reports and approval procedures, promoting effective drug therapy, checking records, providing authorization for training, job objectives, performance standards and administering all other personnel tasks. Competencies for this post include ethical conduct, technical capacities, supervisory responsibilities, thoroughness and strategic thinking skills. Qualifications considered mandatory for this post is a deep insight of dosage administration, measurement; outstanding knowledge of pharmacy information systems and good organizing skills. The post requires a College degree in Pharmacy. Summary : Healthcare professional offering over 20 years of experience managing pharmaceutical care for patients, in a clinical practice setting. Possess expertise in quality medical management, patient care, and resolution. Ability to effectively collaborate with a range of healthcare professionals. Responsible for formulary management (co-chair pharmacy and therapeutics committee), drug cost analysis, policy and procedure development for 40-bed hospital and oncology outpatient clinics (pediatrics, surgical oncology, hematology, peri-operative services). Pharmacy services for oncology outpatient infusion center and inpatient hospitalized patients averaged 100 compounded chemotherapies per day. Responsible for oversight of research pharmacy with a total of >200 plus protocols. Implemented quality initiative to increase patient satisfaction by improving turnaround times for medication distribution (60 mins). Chaired medication events team- analyzed and trended medication errors data with zero categories. Regulatory compliance with state/federal agencies with successful doh, jcaho and ahca surveys. Managed operations of the pharmacy, 40-bed hospital and oncology outpatient clinics; direct reports: 28 FTE. Implemented Cerner pharm net pharmacy system and maintained pharmacy database and pyxis profile medstation 2000 (12 units). Managed daily operations of Miami heart institute, (200 beds) and mt. Sinai medical center (707 beds). Direct reports:50 FTE. Maximized pyxis automated system to enhance efficiencies of distribution and implemented conversion of Meditech computer system to hboc star. 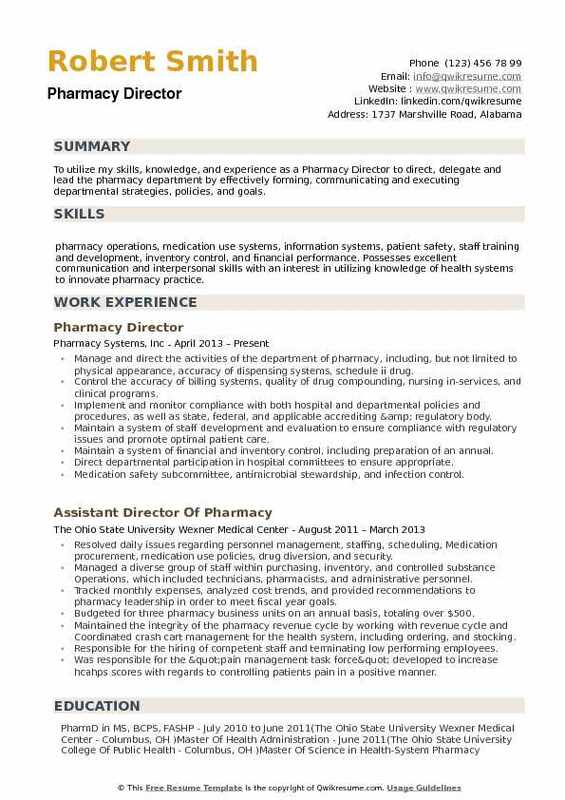 Summary : Director of Pharmacy seeking to offer and expand my clinical knowledge with a company offering opportunity for growth and development. Willing to relocate and reciprocate licensure. Pursuing board certification. Oversight and administration of the pharmacy department of a 200-bed acute care hospital. Solid background of successive performance-based accomplishments of the organization and strategic planning through purchasing, inventory controls, and formulary management. Supervising state and federal license compliance of the pharmacy department. Responsible for ensuring that all the medication management standards were in compliance and policies were in place to address all the standards. Developing workflows for the efficient running of the pharmacy department. Conducted relocation and renovations of the pharmacy to improve functionality and enhance workflow. Designed, built, tested and implemented an electronic health record system including a new pharmacy system (GE Centricity Enterprise). Extensive knowledge of pharmacy computer systems including mckesson iseries and ge centricity enterprise. Sustained hospital formulary, minimizing non-formulary procurements, utilized therapeutic interchanges and promotes rational drug therapy selection. Summary : An Energetic, passionate Director Of Pharmacy with a proven track record for improving operational and financial performance within a Health System. Provide outstanding and efficient healthcare services to pediatric patients. Skills : Extensive Knowledge Of Medications And Their Indications, Contraindications, Dosing, Side Effects, And Proper Administration. Determine the objectives of the department; plan, organize and direct general pharmacy policies and procedures. Handles and orders narcotics for the hospital and maintain an adequate drug supply. Review daily billing log to ensure pharmacy charges are billed correctly. Conduct routine audits the nursing use of Pyxis to ensure compliance with established policies and procedures. Ensures that the pharmacy department has 24-hour coverage by a pharmacist. Serve on the infection control committee and the medical executive committee. Monitor drug therapy to evaluate the appropriateness of use, dose, dosage form, regimen, route, therapeutic duplication, and drug interactions. Serve as subject matter expert in asp, pharmacy operations, and medication management. Assists with quality and risk management to update facility policies and procedures and ensure document control and compliance. Facilitate appropriate ordering and preparation of TPN by identifying and resolving inappropriate orders. Summary : Experienced Director of Pharmacy with strong clinical knowledge combined with a proven ethical and professional track record in solving problems, building morale, and strengthening professional relationships among administrators, physicians and nurses. Skills : Experienced Presenter and Trainer, Routinely Present Drug Information to Physicians and Nurses, Experience With CPOE and EMAR Training throughout the Facility, Advanced Knowledge of HMS Pharmacy and CPOE, Pyxis Medstation 3500 Superuser, HBS and Docutrack. Oversee all aspects of pharmacy operations spanning 5 clinics, including 119-bed acute care facility, ensuring consistent alignment with pharmacy best-practices and state/federal regulatory compliance requirements. Bolstered and maintained a robust medication error reduction program to increase patient safety. Lead patient consults, medication profile reviews, dosing recommendations, physician order verification and compounding. Serve on an array of committees, including medication error reduction plan (chair), medication reconciliation committee, emergency preparedness committee, quality control committee, pharmacy therapeutics committee, clinical council committee. Perform pharmacy operations management, supervising pharmacy staff of 6. Let the installation of pyxis iv towers which brought a gross revenue increase of $88,800 in 6 months. Played a key role in the success of the joint commission survey, being the first director of pharmacy in a position to not have findings in the pharmacy department. Promotes teamwork within the pharmacy department in conjunction with administration and nurses. Summary : A results-driven Pharmacy Director with a Doctor of Pharmacy degree and over 11 years of Managed Care experience. A strong communicator who is able to keep complex problems simple. Several years of experience in the oversight of projects and managing people. Effective at building and maintaining successful relationships with vendors, outside contacts and other health care professionals to accomplish responsibilities. Reporting into vice president of professional services. Currently manage a staff of 175 pharmacists, technicians and support personnel. Maintaining 10 pharmacy operations for community medical centers corporation in the Fresno area. (2 acute care facilities (833 beds), 1 psychiatric facility (56 beds), 1 sub-acute care facility (106 beds), 3 outpatient pharmacies, 2 ambulatory infusion centers and 1 home infusion facility. Implemented RFID technology at in the hospital that has reduced the time required to monitor outdated, decrease turnaround time for kits and carts, enhanced the oncology program by bringing in advanced trained oncology pharmacists. Implemented temp track system to monitor all medication-related refrigeration units throughout the system to prevent loss of medications. Completed the planning and construction of four state of the art USP 797/800 compliant IV sterile compounding facilities. Implemented ed based med reconciliation program with the emphasis on attaining 90% coverage by the pharmacy. Implemented complete review of all regulatory policies and procedures to meet California Department of health, California board of pharmacy, the joint commission and cms regulations. Proposed plans for a centralized automated dispensing pharmacy that will provide service to 5 facilities and reduce inventory by $1,000,000. 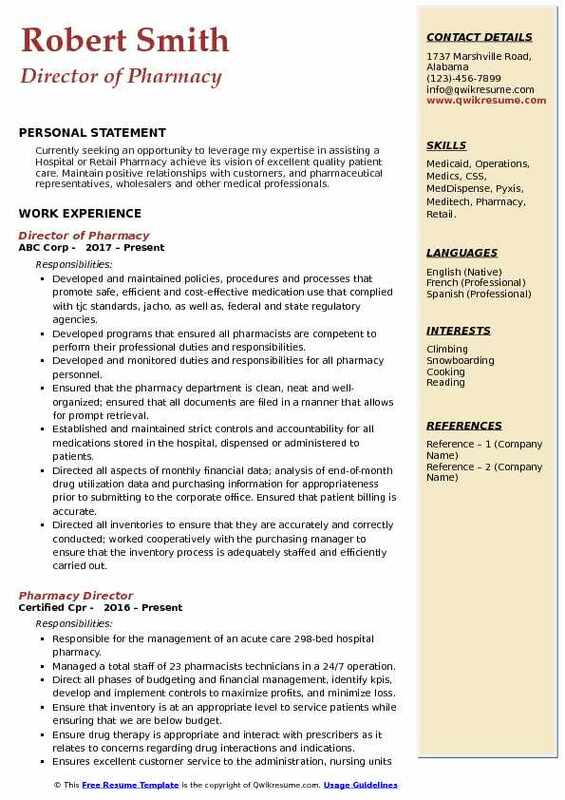 Summary : Detail-oriented pharmacist with Doctor of Pharmacy degree and 2 years of experience in a retail/compounding hybrid independent pharmacy. Specialized training in pharmaceutical compounding. Currently licensed in Tennessee. Kentucky license pending. Adept at all areas of daily management and inventory control. Directly supervise seven pharmacy technicians and seven pharmacists in a long-term acute care setting. Management of 7-8 team members including direct pharmacy care coordinators and PBM pharmacists. Develop, implement, and maintain pharmacy policies and protocols in accordance with pharmacists standards, state and federal laws, and organizational needs. Promote and manage the use of technology to improve the medication use systems to bring about quality patient outcomes, example - successfully implemented Pyxis medication dispensing system within 6 months of arrival to the job that has improved workflow and efficiency and simplified inventory management. Successfully implemented a non-punitive medication reporting program that has helped in error detection and prevention. Promote, support, and ensure compliance with all regulatory agencies including DEA, the joint commission, and cms. Develop and maintain educational material for the staff to promote growth and ensure improved patient outcome and high clinical standards. Promote and maintain an effective working relationship with patients and their families, physicians, hospital administrators, employees, and vendors. 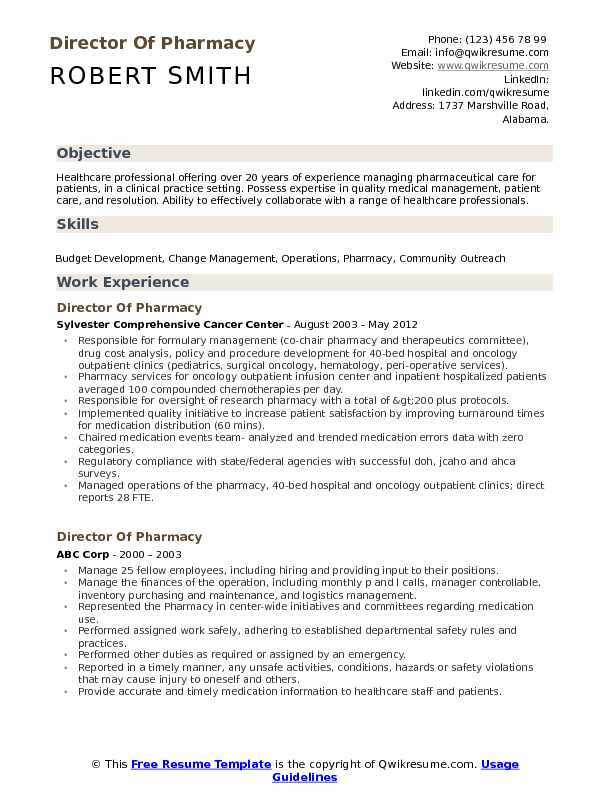 Summary : To seek a position as a Director pharmacist in an evolving company. 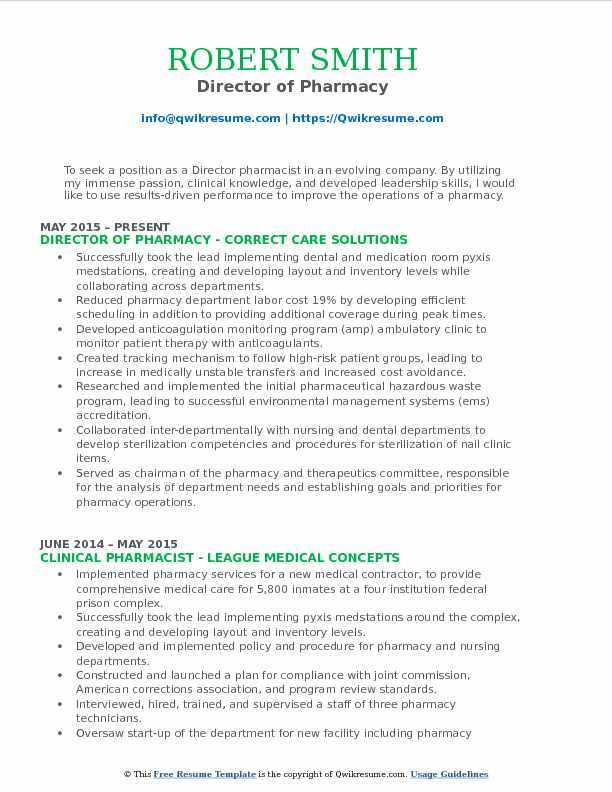 By utilizing my immense passion, clinical knowledge, and developed leadership skills, I would like to use results-driven performance to improve the operations of a pharmacy. Successfully took the lead implementing dental and medication room pyxis medstations, creating and developing layout and inventory levels while collaborating across departments. Reduced pharmacy department labor cost 19% by developing efficient scheduling in addition to providing additional coverage during peak times. Developed anticoagulation monitoring program (amp) ambulatory clinic to monitor patient therapy with anticoagulants. Created tracking mechanism to follow high-risk patient groups, leading to increase in medically unstable transfers and increased cost avoidance. Researched and implemented the initial pharmaceutical hazardous waste program, leading to successful environmental management systems (ems) accreditation. Collaborated inter-departmentally with nursing and dental departments to develop sterilization competencies and procedures for sterilization of nail clinic items. Served as chairman of the pharmacy and therapeutics committee, responsible for the analysis of department needs and establishing goals and priorities for pharmacy operations. Serve as the liaison and leader for the pharmacy department for the mercy rehabilitation facilities. 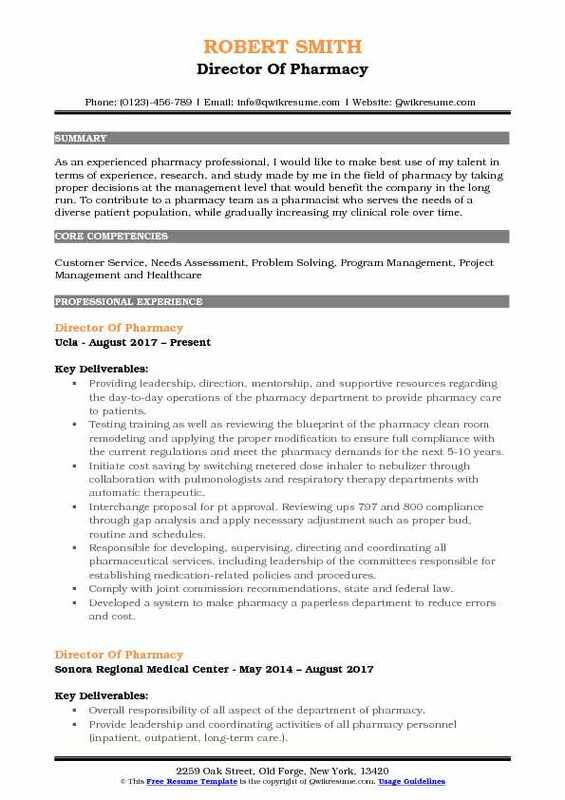 Summary : As an experienced pharmacy professional, I would like to make best use of my talent in terms of experience, research, and study made by me in the field of pharmacy by taking proper decisions at the management level that would benefit the company in the long run. 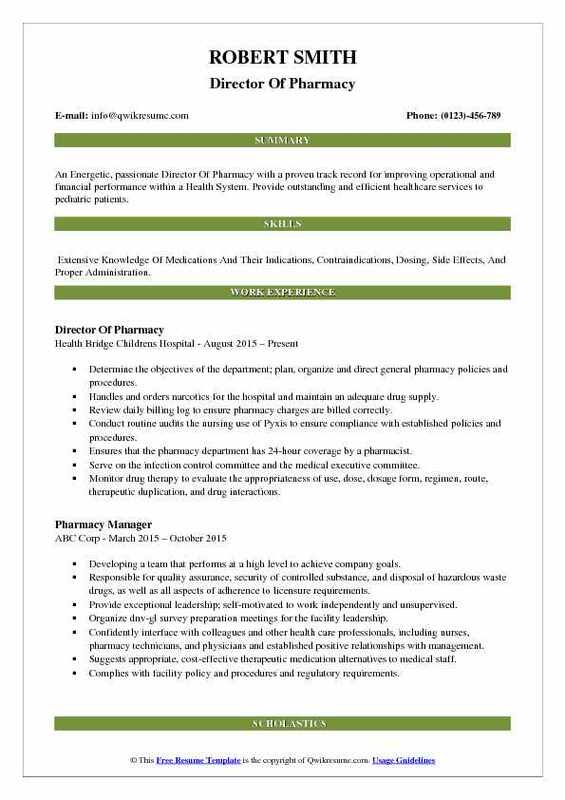 To contribute to a pharmacy team as a pharmacist who serves the needs of a diverse patient population, while gradually increasing my clinical role over time. Providing leadership, direction, mentorship, and supportive resources regarding the day-to-day operations of the pharmacy department to provide pharmacy care to patients. Testing training as well as reviewing the blueprint of the pharmacy clean room remodeling and applying the proper modification to ensure full compliance with the current regulations and meet the pharmacy demands for the next 5-10 years. Initiate cost saving by switching metered dose inhaler to nebulizer through collaboration with pulmonologists and respiratory therapy departments with automatic therapeutic. Interchange proposal for pt approval. Reviewing ups 797 and 800 compliance through gap analysis and apply necessary adjustment such as proper bud, routine and schedules. Responsible for developing, supervising, directing and coordinating all pharmaceutical services, including leadership of the committees responsible for establishing medication-related policies and procedures. Comply with joint commission recommendations, state and federal law. Developed a system to make pharmacy a paperless department to reduce errors and cost. Effectively supervised pharmacy operation activities and provides support to the whole pharmacy team. 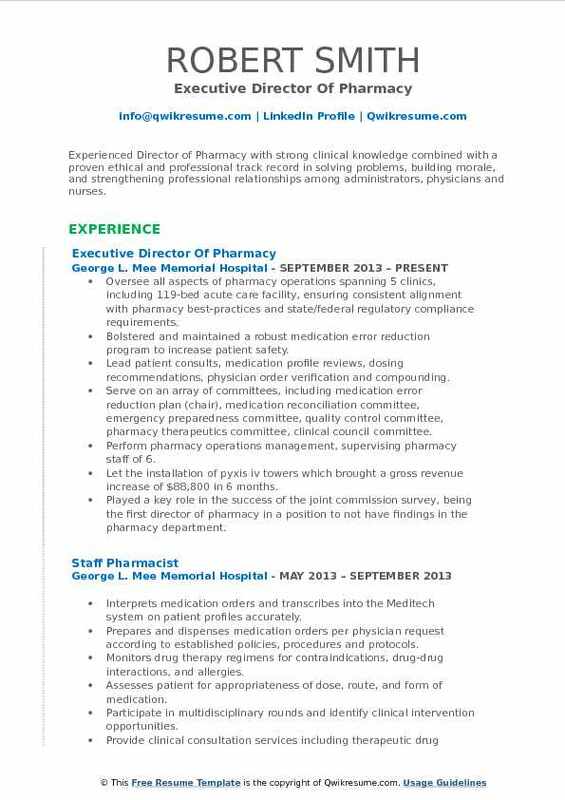 Summary : Currently seeking an opportunity to leverage my expertise in assisting a Hospital or Retail Pharmacy achieve its vision of excellent quality patient care. Maintain positive relationships with customers, and pharmaceutical representatives, wholesalers and other medical professionals. Skills : Medicaid, Operations, Medics, CSS, MedDispense, Pyxis, Meditech, Pharmacy, Retail. Developed and maintained policies, procedures and processes that promote safe, efficient and cost-effective medication use that complied with tjc standards, jacho, as well as, federal and state regulatory agencies. Developed programs that ensured all pharmacists are competent to perform their professional duties and responsibilities. Developed and monitored duties and responsibilities for all pharmacy personnel. Ensured that the pharmacy department is clean, neat and well-organized; ensured that all documents are filed in a manner that allows for prompt retrieval. Established and maintained strict controls and accountability for all medications stored in the hospital, dispensed or administered to patients. Directed all aspects of monthly financial data; analysis of end-of-month drug utilization data and purchasing information for appropriateness prior to submitting to the corporate office. Ensured that patient billing is accurate. Directed all inventories to ensure that they are accurately and correctly conducted; worked cooperatively with the purchasing manager to ensure that the inventory process is adequately staffed and efficiently carried out. Prepared work schedules and workload statistics; maintained an appropriate staffing level to ensure that the services and responsibilities of the department are provided in a timely and quality manner. 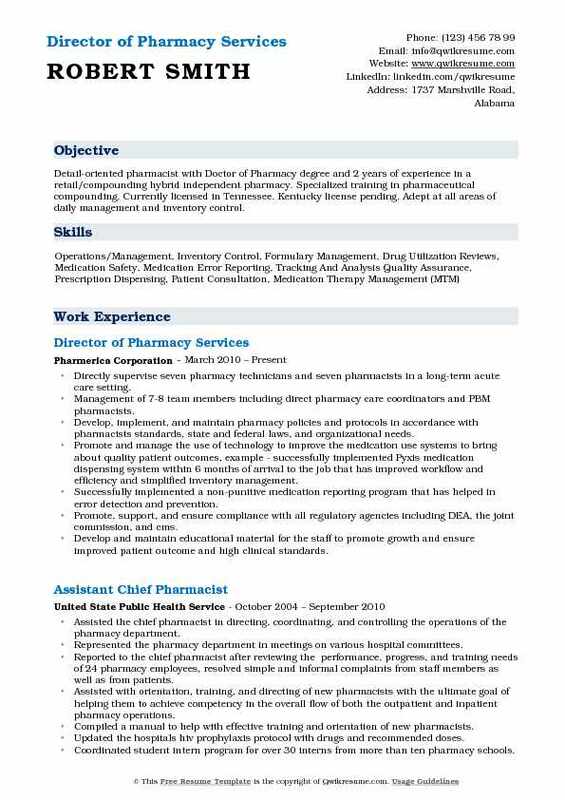 Summary : To utilize my skills, knowledge, and experience as a Pharmacy Director to direct, delegate and lead the pharmacy department by effectively forming, communicating and executing departmental strategies, policies, and goals. Skills : pharmacy operations, medication use systems, information systems, patient safety, staff training and development, inventory control, and financial performance. Possesses excellent communication and interpersonal skills with an interest in utilizing knowledge of health systems to innovate pharmacy practice. Manage and direct the activities of the department of pharmacy, including, but not limited to: physical appearance, accuracy of dispensing systems, schedule ii drug. Control the accuracy of billing systems, quality of drug compounding, nursing in-services, and clinical programs. Implement and monitor compliance with both hospital and departmental policies and procedures, as well as state, federal, and applicable accrediting & regulatory body. Maintain a system of staff development and evaluation to ensure compliance with regulatory issues and promote optimal patient care. Maintain a system of financial and inventory control, including preparation of an annual. Direct departmental participation in hospital committees to ensure appropriate. Medication safety subcommittee, antimicrobial stewardship, and infection control. Ensure that the goals of hospital administration are understood and priorities are. Summary : To bring the diverse skills I have developed as a pharmacist and a Director of Pharmacy in a wide variety of settings to a challenging hospital position. Created the department as part of the ‘start-up team’ for this new facility and successfully led the department through initial licensing and numerous inspections and surveys to obtain state and Medicare licensing. 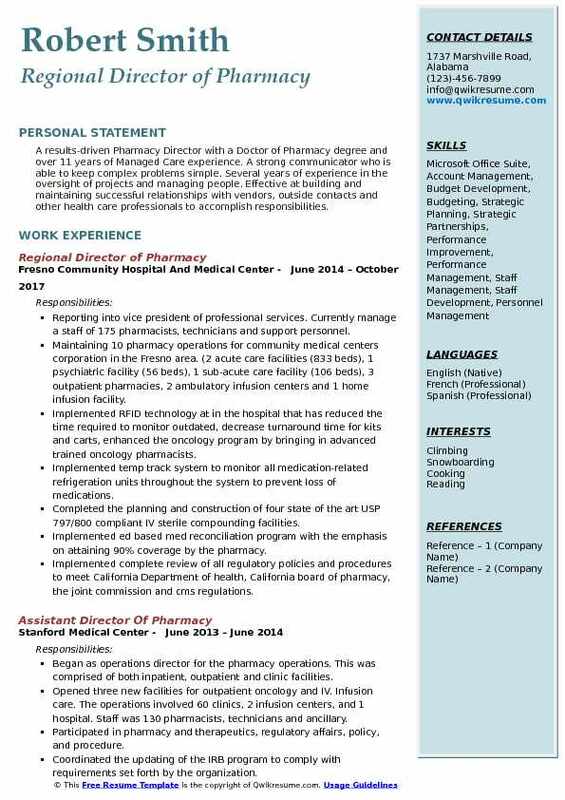 Single-handedly led all aspects of pharmacy operations for 7 months, including developing computer software for e-pharmacy from hcs, chartpad cpoe system, omnicenter programming and mapping of all three systems. Provide detailed reports using sophisticated hyperlinking methods for easy understanding for departmental meetings and as reporting is appropriate. Maintain accurate and efficient narcotic control, procurement and documentation. Plan, direct and monitor all financial, operational, professional and clinical activities of the department. Implement policies and procedures that ensure the pharmacy department meets all legal, accreditation and certification requirements, including compliant 797 processes and regulations. Involved in ramp-ups involving increasing patient numbers to meet the hospital needs while providing safe and effective medical treatment and guidance to the patients.